Swimming is a safe, low-impact option for women with asthma. Exercising with asthma can be a challenge, but that doesn't mean you should spend your free time sitting on the couch. For optimal health, strive to perform 30 minutes of cardiovascular exercise five times a week. To get the most out of your workouts and prevent the likelihood of an exercise-induced asthma attack, select low-impact aerobic exercises. Taking a walk, fitting in a 30-minute swim or grabbing your bike and exploring your town are great choices. Asthma is characterized by chronic inflammation of the airways that deliver oxygen to and from your lungs. When these airways become swollen and constricted -- usually in response to a specific trigger -- asthma symptoms, including coughing, shortness of breath, chest tightness and wheezing, can occur. The American Council on Exercise estimates that exercise is a symptom trigger for 90 percent of asthma sufferers, and 5 to 10 percent of otherwise asthma-free American adults experience exercise-induced asthma, which is a type of asthma triggered only by exercise. While this may make many asthma sufferers wary of exercise, aerobic exercise can actually help improve asthma by strengthening your lungs and breathing muscles. 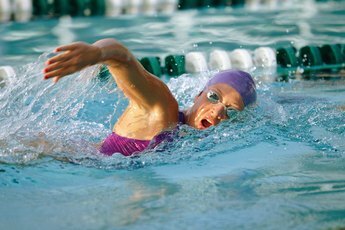 The American Academy of Allergy Asthma and Immunology considers swimming to be one of the best exercises for asthma sufferers. When you breathe normally, the air you take in is warmed and moisturized by your nose before traveling to your lungs. During moderate or high-intensity exercise, however, most people breathe through their mouths, allowing cool, dry air to enter the lungs, and this intake of cool, dry air is often responsible for asthma symptoms during exercise. Swimmers breathe close to the water's surface, so the air they breathe is already warm and humid, which lowers the risk of an exercise-induced asthma attack. The horizontal position used in swimming has also been linked to lower levels of mucus in the lungs. 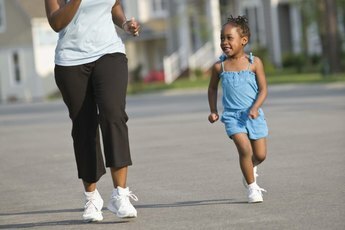 Walking is low-impact and low-intensity, which makes it a good exercise for asthmatics. Since it is less demanding than more vigorous types of exercise, you are less likely to become short of breath and breathe through your mouth, which often causes asthma symptoms. Walking also helps to lower blood pressure and cholesterol levels and reduces the risk of developing Type 2 diabetes. Grab your girlfriends and hit the pavement or take your walk indoors and do some window shopping while you exercise. For asthma sufferers, leisurely biking is another effective, low-impact exercise option. As with walking and swimming, biking allows you to control the duration and intensity of your workout. Aim to keep your heart rate in the lower end of its target range and breathe through your nose rather than through your mouth. In addition to providing a great cardio workout, biking also helps to tone your lower body, keep your weight in check and minimize your risk of heart disease. Work closely with your physician to develop a safe and effective exercise plan. Keep all prescribed medications on hand during your workout, and watch for signs of exercise-induced asthma, which can include shortness of breath and coughing. Always warm up and cool down before and after each workout, and be mindful of other allergens and air quality if you are exercising outdoors. During springtime, when pollen is at its peak, exercise indoors or use an allergy mask. Avoid exercising in low temperatures, and steer clear of skiing, scuba diving and endurance activities such as long-distance running.